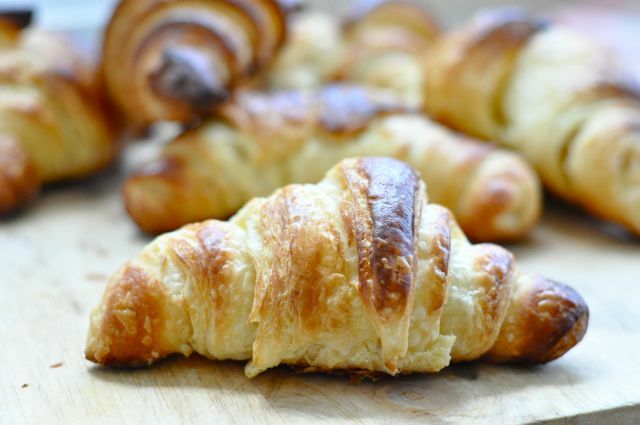 I thought it was a terrible shame that he would go through his life without someone who loved him enough to make croissants, because the whole world knows that those tasty little French pastries are an utter ball-ache to make, and I, for one, was not interested in such pursuits. But, you know, sometimes that little seed gets sown in your brain and, slowly, slowly it can germinate into a hair-brained idea that maybe, just maybe, you do love your husband enough to bestow upon him a calorie-laden delicacy extrava-ma-ganza. I started to look around at a few recipes and I got the resounding impression that these were going to be a commitment…..much like marriage. I decided that I was going to give this infamous pastry a crack. When I told my mother I was doing them, her response was bolstering. My biggest EVER culinary disaster was croissants (and gnocchi), said she. 1) If no one has ever challenged the quality or quantity of your love, and you have a life, just buy them. 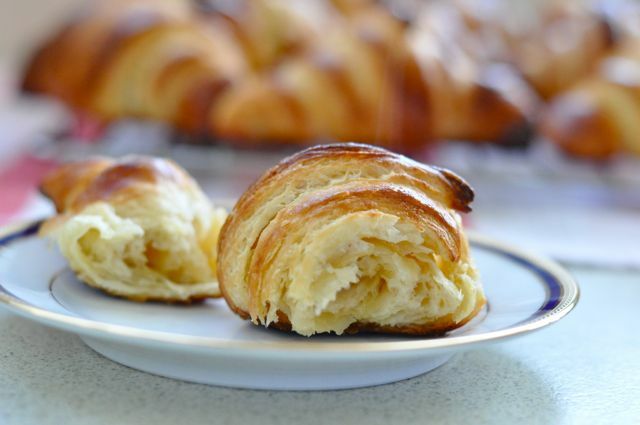 2) These were some of THE best tasting croissants I ever did eat. I dare say we have a quandary, no? 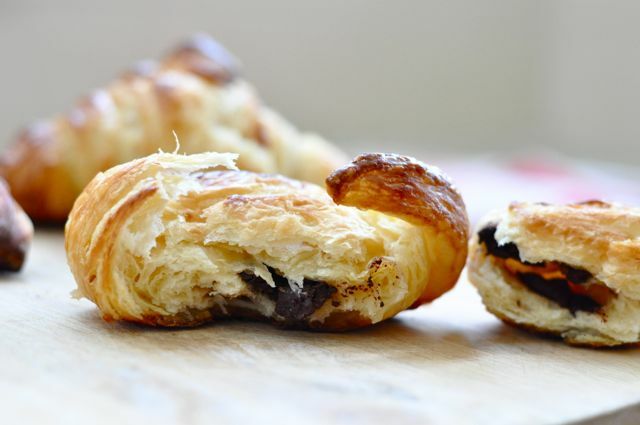 Read this and decide from there your chosen method of croissant acquisition. It’s not that they’re difficult, because they really aren’t, but time-consuming they most certainly are. In a 24 hour period, they got more rest than the rest of the family combined, but the good news is while they’re resting, you can be doing whatever the hell you like. Yield : 15-20 croissants depending how big you make them. 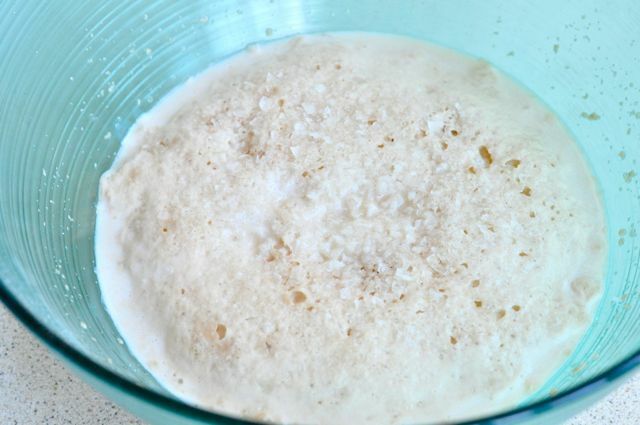 Put your sugar, salt and yeast into your warm milk and leave for about 10 minutes. You need it to get activated, and it needs to be foamy. The recipe I was following said if it wasn’t frothy, toss it and start again…..I did that once. Second time looked a bit more active so I thought, LET’S GET THIS SHOW ON THE ROAD!!! Once foamy, add 3 3/4 cups flour and the salt. My recipe called for a stand mixer, but I only have a hand mixer (are you reading this KitchenAid? I will spruik your product til the cows come home, with no qualms about selling my arse, if you send me a red one) which I used with dough hook attachments. Mix on low-speed until dough comes together and is soft; about 7 minutes. 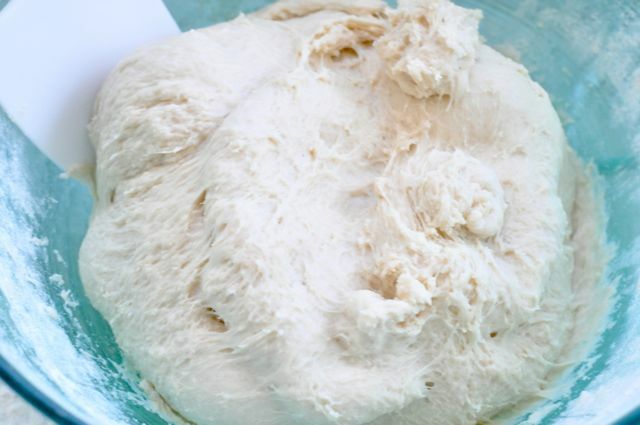 Transfer dough to your workspace and knead by hand for a minute or 2, using more flour to make it silky and not sticky. 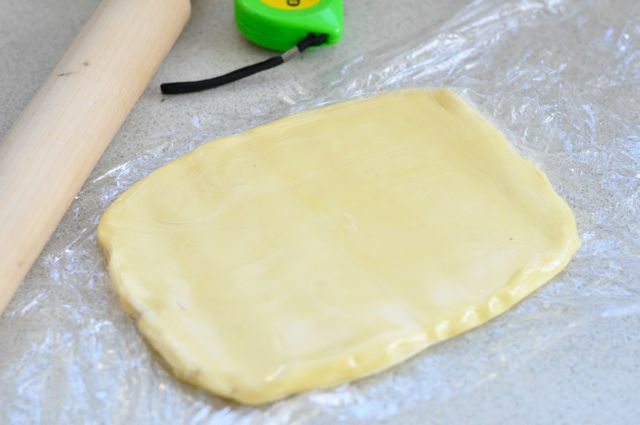 Form dough into a 1 1/2 inch thick rectangle, wrap in plastic wrap and chill for one hour. I got distracted at the park and mine chilled for two hours but who’s counting, right? Pull your butter from fridge and cut into even sticks. Lay them next to each other. 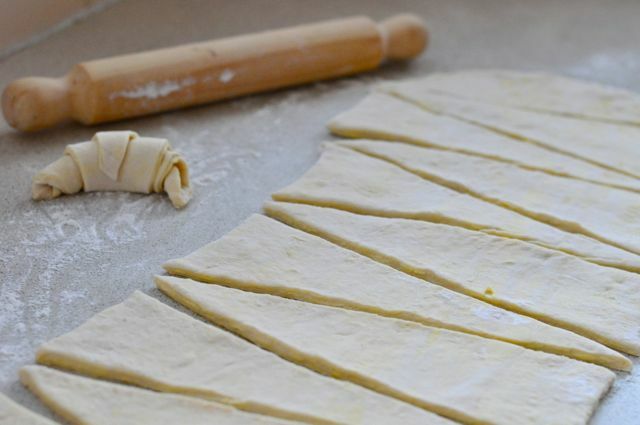 Press down on it with the rolling-pin and roll and bash and roll into 8 x 5 inch rectangle. Once done, wrap in plastic wrap and chill while rolling dough. LOOK AT THAT BUTTER!!!!!! Arteries hardening yet? 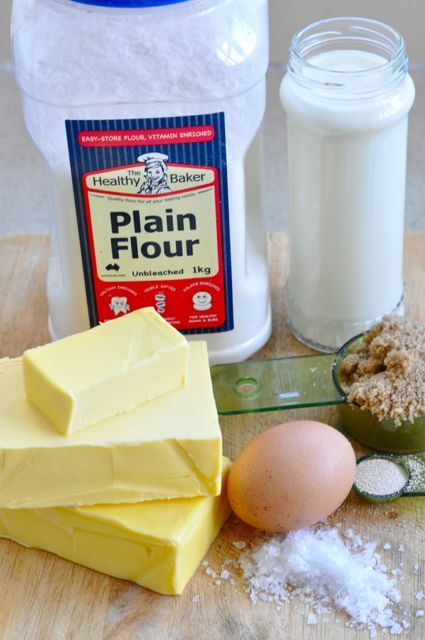 Remove dough from fridge, unwrap and sit on a lightly floured counter. 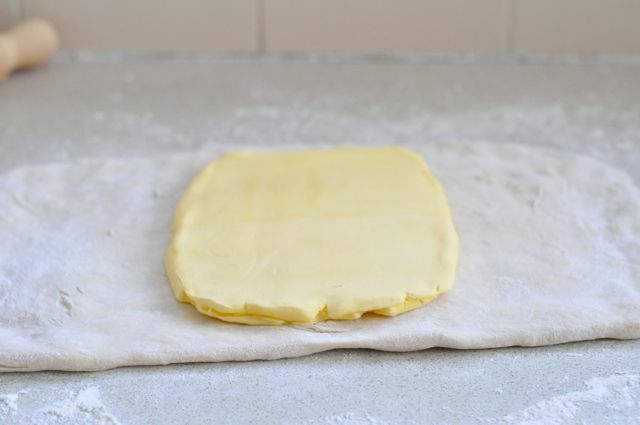 Stretch the dough into a 16 x 10 inch rectangle. It was kind of like making a pizza but a rectangle. Be sure to measure as it does matter. Place dough with a short end near you. Stick your butter in the middle of the dough, then fold the ends up to encase it top half down and bottom half up. Turn your parcel so the short side is facing you, and use the rolling-pin to evenly roll your dough into a 15 x 10 inch rectangle, rolling out to the ends but not actually over the ends. Again, fold the dough as before; top half down and bottom half up, and stretch so the corners are square. This should form about a 10 x 5 inch rectangle. Glad Wrap it and chuck it in the fridge for an hour…..or two, because you get distracted hanging washing and putting kids down for a sleep. Repeat step 3 THREE more times, for a total of four folds, chilling the dough for one hour after each fold. 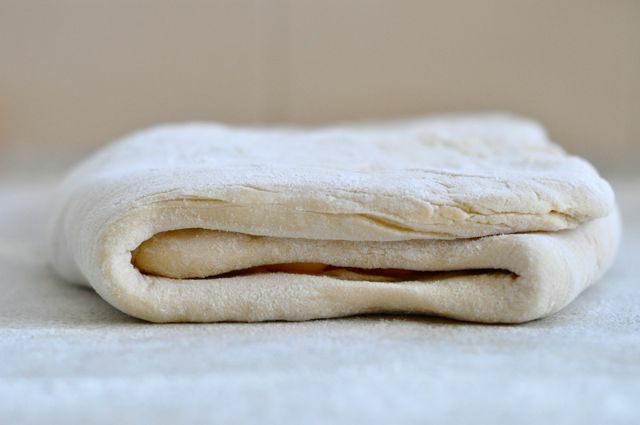 After the fourth and final fold, wrap dough tightly with plastic wrap and chill for 8-12 hours, no longer. I wasn’t sure if that was three times the two folds, or four folds all together so I kinda split the difference…..now, I realise that the more folds, the better as it makes the layer upon layer of buttery, light, fluffy goodness……next time, I shall do four times the two folds……then I went to bed and let my little butter-ball get a good night’s sleep in the fridge. When dough is ready, roll out to a very long and skinny rectangle, about 15 x 32 inches. 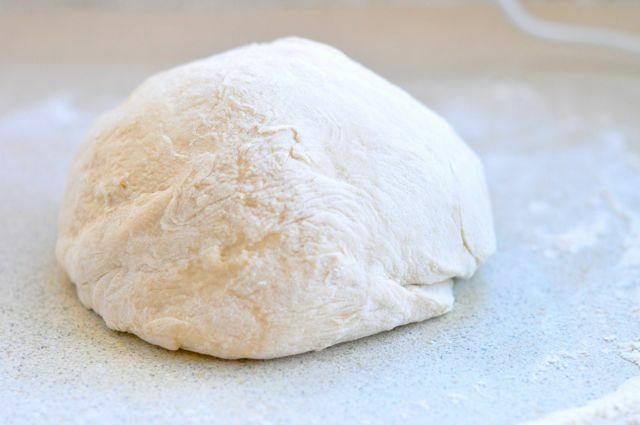 (If your counter is small, you can break the dough in half and do this in 2 sections). 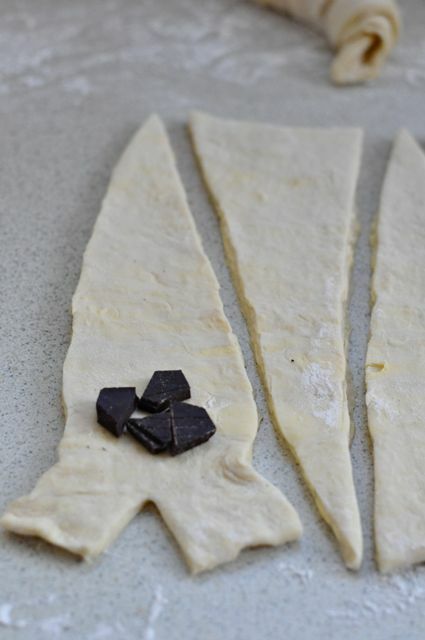 Cut the dough into long triangles. 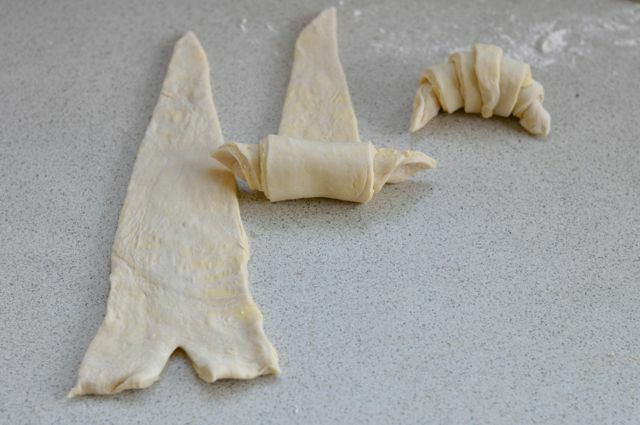 Cut a small vertical slit right into the middle of the straight end, and using both hands, roll croissant up pushing the sides out to either side to form your crescent. Line trays with baking paper and lie your little delicacies about 2-3 inches apart, cover with a towel and set in a warm place to rise for 1-2 hours. Tempting to skip this last one, but they did rise a little more……even though I only left them for one hour. I will admit freely that by now I was getting a tad impatient….we were coming up to our 20th hour of doughy relationship. Pre-heat oven to 230C. 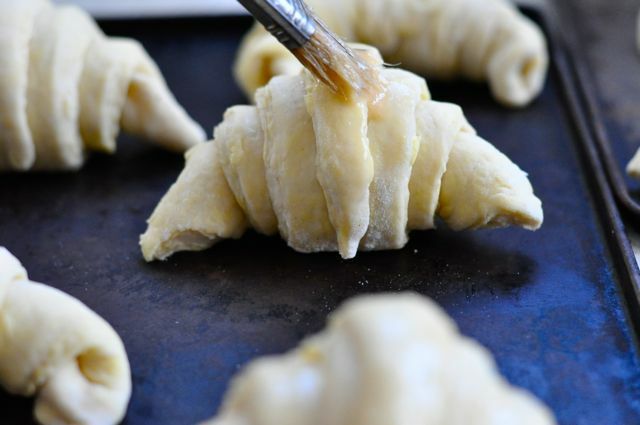 Brush croissants with beaten egg then, bake for 12-14 minutes, or until golden brown. Let cool before removing from tray and cooling on a wire rack…..unless you’re too excited and you shovel one straight into your mouth and burn the knobbly bit behind your teeth. I rolled a piece of Lindt Dark chocolate into four of mine as a surprise……and it was a very nice surprise indeed. These were not quite as airy as some I’ve had, resulting in a slightly more doughy croissant. I think I’ll try fresh yeast next time and the multiple fold thing I talked about………the taste? Oh my sweet baby Jesus, these tasted awesome. Butterier (hmmmm, think I made that word up) than the average bakery ones and the perfect balance of yeasty sweetness. I declare these a success, and they are only going to improve with practice. I ate two straight away and then I did something really mean…..I took a load of them to my bootcamp class and off loaded them to the ladies thereby rendering their last hour of exercise null and void. But I did it because I love to share…..and for self-preservation. The rest I offered to my darling husband, as a token of my affections, and he is now smug in his knowledge that I am 100% crazy about him. Au contraire! I think it was easier than it seemed, but much longer! How do bakers do it?? Plus all the other delicacies??? They lasted three days.,.. You can’t eat more than two in a sitting!!! As a retired Home Ec. teacher…I gotta say…I’m sooo impressed with your courage to try something that I’ve never even heard could be homemade!!! Even for the love of your husband!! Well done! They look delicious…I could almost smell them baking, and could for sure taste that butter (and chocolate!)!!! The smell coming from the kitchen, even whilst proving, was amazing. Thanks for being impressed. I’m pretty chuffed!! As well you should be!! They look lovely! I wish I had the patience to go through all of that work and waiting, hence why I used the puff pastry instead. 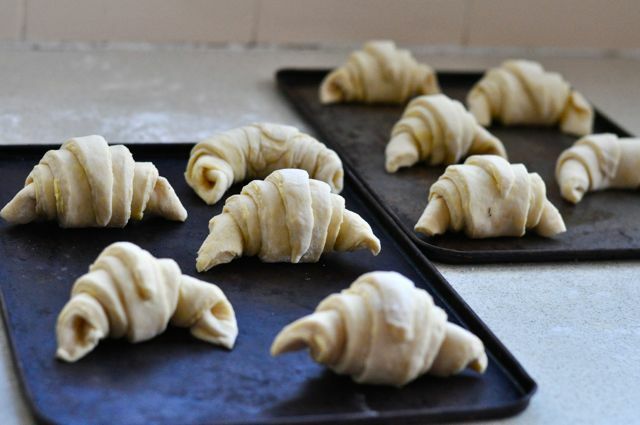 One day though, I would like to have a crack at making my own… It sounds impressive when you can say that you’ve made croissants from scratch. Or just buy them and pretend…. They look great, it is difficult to get them just like the ones in France. I think they use a combination of steam and bake for the right results. Thanks for stopping by my blog so I could find yours. I love your writing style! Following you and looking forward to seeing more posts. Perhaps I should try it next! Those are beautiful. Love me some croissants. Yum. Imagine a whole kitchen counter bursting with them…. SOunds like a challenge…. I love a challenge. I also have a horrid gas oven that doesn’t regulate temprature very well and doesn’t brown anything as it doesny have a grill. Baking can be somewhat of a hit and miss affair. I wont be trying to make these until i have access to a proper oven, because after 24hrs of coddling dough i would be massively peeved if it flopped. I can’t believe you made your own croissants!!! I love to cook, and I think I fair pretty well – but baking? Forget about it. It’s something about the flour, or my hands!? I don’t know. This is super impressive. Dare I even try to mimic this recipe?! By now you have, no doubt, extra bouts of practice and many batches made. Anything you’ve done differently to make them better? Anyways, Just randomly wandered on this blog while wordpress surfing. Hope I can keep up – following! I’m sure you can keep up!! Haven’t done them again as yet but I’m planning on doing them for Xmas morning…. Nutella on half and Xmas spice on the other half. Give them a go. They’re honestly not difficult, just time consuming. Don’t be intimidated, my friend. These were not hard, but time consuming. If not to cook them at least to buy them and speak with a French accent while you munch! I’m so thrilled!! Aren’t they yummy?! See what I mean by not difficult just laborious? Time to enjoy your efforts and eat many!!! I’m impressed you made them…. You rock! !